By the late 1980s, the side-scrolling beat-‘em-up genre had become hugely popular amongst gamers, especially in the arcades, so it was no surprise that some companies who held licences to existing products of other mediums attempted to take advantage of this and create video games that applied a popular license to a popular genre. A good example was the arcade title Teenage Mutant Ninja Turtles, which I talked about in Part 1, and this was far from the last video game to feature the Turtles in an effort to exploit their popularity: the arcades later received the sequel Teenage Mutant Ninja Turtles: Turtles In Time, which was also released on the Super Nintendo, while some Turtles beat-‘em-ups exclusive to home systems included Teenage Mutant Ninja Turtles III: The Manhattan Project on the NES, and Teenage Mutant Ninja Turtles: The Hyperstone Heist on the Sega Mega Drive, although the latter title borrowed heavily from Turtles In Time. And I am now officially sick of writing the word “Turtles”. Of course, the Teenage Mutant Ninja Turtles (Christ, there it is again) weren’t the only massively popular pop culture phenomenon of the late 1980s / early 1990s. Matt Groening’s animated television series The Simpsons quickly became a worldwide hit that continues to air new episodes today, having become in 2009 the longest-running American primetime, scripted television series. The success of The Simpsons led to a flood of related merchandise, including The Simpsons Arcade Game, a side-scrolling beat-‘em-up developed by Konami which saw Homer, Marge, Bart, and Lisa attempt to rescue the kidnapped Maggie (My first Part 2 mention of the “kidnapped loved one” plot! Yay!). 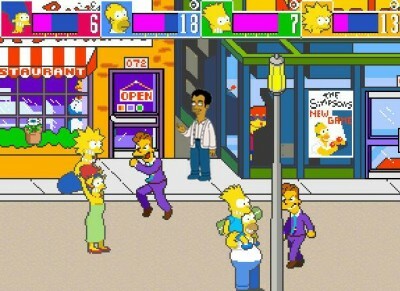 Although the characters may have been unnaturally shoehorned into a beat-‘em-up – Marge attacks with a vacuum cleaner, Lisa a skipping rope – the game was a high-quality title, featuring impressive graphics faithful to the animated series, four-player cooperative play, characters voiced by the original actors, and a variety of special two-player combination attacks. Another licensed video game of note wasn’t based on a popular animated television series but rather something that was a combination of pop music and cinema. While it was more a barely structured collection of extended music videos rather than an actual narrative movie, 1988’s Moonwalker, starring Michael Jackson, was a commercial success at the box office, and this led to several video game adaptions beginning the following year. While the home computer and console versions of the game were essentially platform games, the 1990 arcade version was a beat-‘em-up. If you’ve been crying out for a video game where a chimp transforms you into a laser-blasting robot and you fight Joe Pesci on the moon, then this is the game for you. The colour, dynamism, and violence – violence which, like the majority of the violence found in video game beat-‘em-ups themselves, was often bloodless – of American superhero comic books translated well to beat-‘em-ups, and the early 1990s saw a slew of such licensed titles appear in arcades and on home systems: Sega’s Spider-Man: The Video Game (1991) was primarily a side-scrolling beat-‘em-up but also contained platforming sections; Konami’s X-Men (1992) offered simultaneous cooperative play for up to six players and laughably bad dialogue to which grammar was a strange and alien concept (“Welcome to die!”); and Capcom had the sense to include firearms for the titular gun-toting vigilante in The Punisher (1993). While some superhero beat-em-‘ups such as Spider-Man: The Video Game barely bothered with story (Mary Jane’s been kidnapped? What a twist! ), others such as The Death and Return of Superman and Marvel Super Heroes: War of the Gems were adapted from existing comic book stories, with some titles being impressively faithful adaptions. 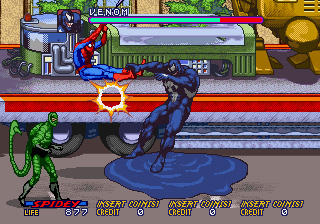 For example, for its cut-scenes, Spider-Man and Venom: Maximum Carnage frequently used art and dialogue taken directly from the comics. Beat-‘em-up adaptions of some superhero movies of the time also appeared, as seen in the SNES version of Batman Returns, and in Batman Forever: The Arcade Game. Superhero-themed titles weren’t the only side-scrolling beat-‘em-ups to feature fantastical characters, environments, and action. Science fiction themes could be found in games such as Alien Storm, Captain Commando, Cyborg Justice, and Mutation Nation; horror titles included Night Slashers and two Splatterhouse sequels; and the fantasy genre was represented in beat-‘em-ups such as Blade Master, The King of Dragons, several Golden Axe sequels, and two Dungeons & Dragons games subtitled Tower of Doom and Shadow Over Mystara. 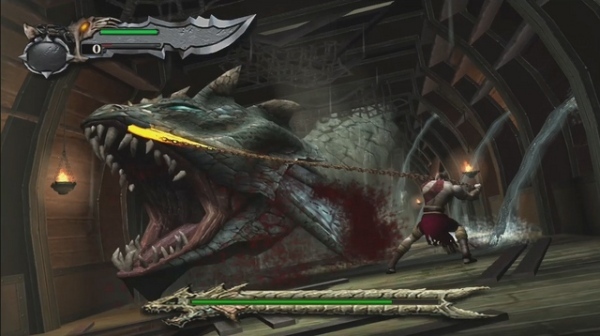 These differing fantastical elements and scenarios continued to be regularly applied to side-scrolling beat-‘em-ups as time passed, due in part to the simple fact that so many beat-‘em-ups were being released as a result of the genre’s popularity, which inevitably led to some developers experimenting with themes, whether due to genuine creative ambition or simply a desire to stand out from the crowd. At the same time, there always remained plenty of room for beat-‘em-ups set in present-day urban environments, with earlier titles such as Renegade and Double Dragon still exerting a huge influence upon the genre. 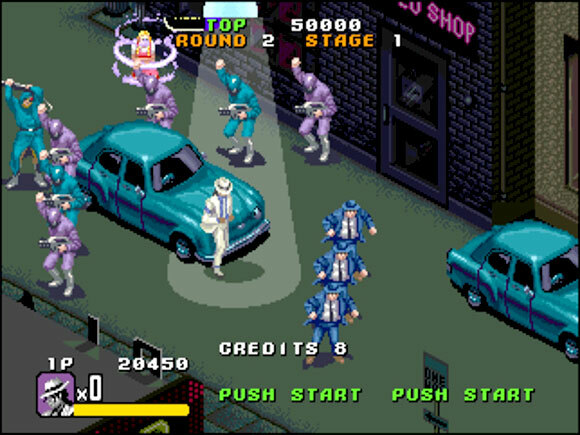 And although games such as Burning Fight, Riot City, Rival Turf, and Vendetta (Crime Fighters 2 in Japan) were mostly forgettable (except perhaps for the memorably named playable character “Oozie Nelson” in Rival Turf) and indistinguishable amongst a sea of similar titles, this certainly wasn’t the case with every present-day urban beat-‘em-up. Capcom’s Final Fight was released in arcades in 1989. The game outshone the majority of other side-scrolling beat-‘em-ups, and is today still regarded as one of the best games ever created in the genre. Final Fight actually started life as Street Fighter ’89, the game originally planned as a follow-up to Capcom’s 1987 one-on-one competitive fighting game Street Fighter. But with such fundamental differences developing between the two games, and with producer Yoshiki Okamoto being influenced by 1988 arcade title Double Dragon II: The Revenge, eventually Street Fighter ‘89 became Final Fight. Street Fighter did eventually receive its follow-up in the form of a direct sequel – some of you might have heard of it. 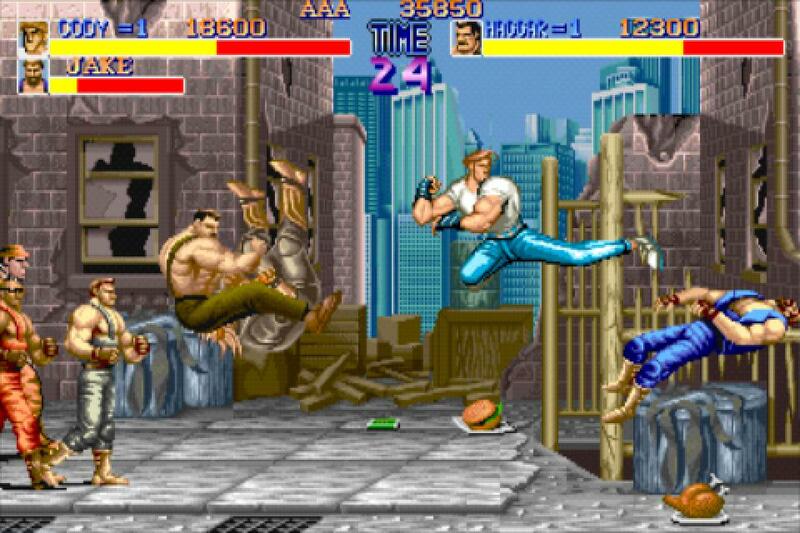 On the surface, Final Fight didn’t really offer anything that gamers hadn’t already experienced in previous beat-‘em-ups: two-player cooperative play, multiple playable characters, a selection of weapons, a present-day urban setting, and a motivation of rescuing a young woman kidnapped by a criminal gang. However, it was the style and skill with which Capcom approached such familiar elements that made the game stand out as a superbly crafted beat-‘em-up. A notable addition was the inclusion of two bonus stages which took place between certain levels, both of which involved causing a set amount of destruction within a time limit, first to a car belonging to an enemy character, and then to a row of glass panes. 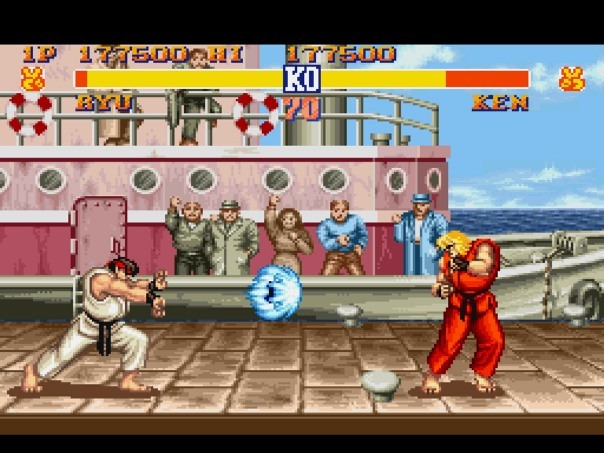 This bonus stage feature would later appear in Street Fighter II, and, like the Street Fighter ’89 connection, would be just one of several ways in which the Street Fighter and Final Fight franchises would end up being connected to each other over the years. 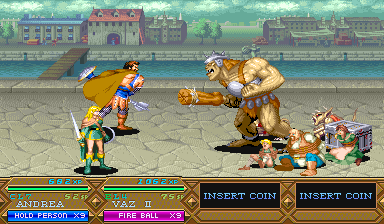 Final Fight featured three playable characters out to rescue the kidnapped Jessica: her father, former professional wrestler turned mayor Haggar; her boyfriend Cody; and Cody’s friend Guy. Each character possessed their own fighting style, and the combat, while outwardly very straightforward, managed to be deep enough so as not to become repetitive, with responsive controls and a real sense of impact. The game was also impressive on a purely technical level, featuring large, detailed characters, and many enemies on-screen simultaneously. 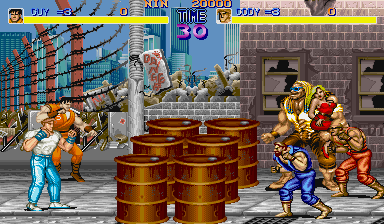 The latter contributed to the challenge presented by the game – although arcade titles usually featured a fairly high level of difficulty (all the better to keep the player slotting in those coins), Final Fight was a particularly punishing beat-‘em-up, with certain boss attacks wiping out over half of the player’s health in a single hit, and one credit only granting the player a total of two lives. The popularity enjoyed by Final Fight in the arcades led to a number of home console and computer ports, and perhaps the best known port – the SNES release – was also the most butchered compared to the original arcade version: an entire level was removed, as was the character of Guy, and the game was single-player only. Such drastic and sweeping omissions led to a release that, although highly praised at the time, was a shadow of its true arcade self, a situation that Capcom attempted to partly improve later with the SNES release of Final Fight Guy, a version of the game that replaced Cody with Guy. One of the most complete and faithful ports of Final Fight to emerge from the early 1990s actually came from Nintendo rival Sega, with the Sega Mega-CD version of the game not only being almost arcade-perfect but also adding new bonus features such as a remixed soundtrack and a time attack mode. The port remains widely regarded as one of the best games released for the Mega-CD, although admittedly it doesn’t have a great deal of competition due to the platform’s limited library of titles. Kris Kross: Make My Video, anyone? Didn’t think so. The success of Final Fight led to a number of follow-ups over the years, including two direct sequels on the SNES, the one-on-one fighting game Final Fight Revenge, and most recently, 2006’s Final Fight: Streetwise. None of these sequels or spinoffs ever made the kind of impact that the original game made, however. Final Fight was a clear influence on a later side-scrolling beat-‘em-up that was similar in that it didn’t seek to reinvent the wheel, but rather be an impressive, high-quality take on the established formula of the present-day urban beat-‘em-up. This game was 1991’s Streets of Rage (Bare Knuckle: Ikari no Tekken in Japan), a title that received no preceding arcade release, but was instead designed for and released exclusively (at first) on the Sega Mega Drive. 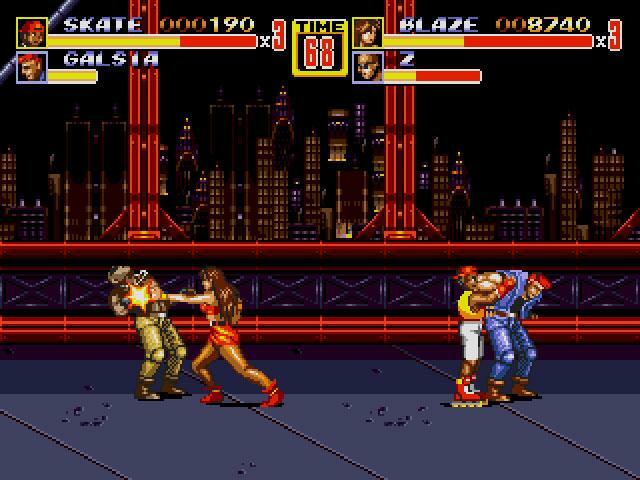 Streets of Rage featured three playable characters – two male and one female – and although there was no kidnapped loved one in sight, the game’s plot was equally basic, involving nothing more than the three protagonists taking down the criminal gang terrorising their city. 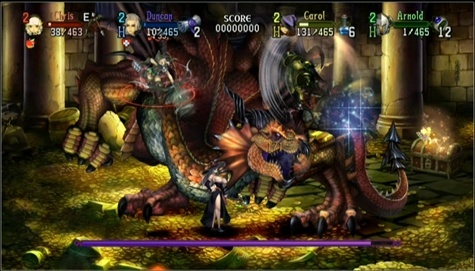 One interesting narrative element that the game did include, however, was an alternate ending only available in two-player mode, where if a player so chose, they could “turn to the dark side” and replace the final boss as the corrupt ruler of the city. Even though the difference in hardware meant that it couldn’t match up to the arcade version of Final Fight from a technical standpoint, Streets of Rage nevertheless still excelled by offering a similarly high level of quality and playability, and was one of the first console-exclusive beat-‘em-ups to outshine many similar arcade titles, becoming both a critical and commercial success. Just one of the elements of Streets of Rage that received a great deal of praise was its experimental and innovative chiptune soundtrack, which was composed by Yuzo Koshiro and is considered highly influential and ahead of its time. The success of Streets of Rage led to a sequel, and 1992 saw the release of Streets of Rage 2, which improved upon the original in numerous ways: more detailed graphics, bigger sprites, longer levels, more enemies, four playable characters rather than three, an even more acclaimed soundtrack (this time by Yuzo Koshiro and Motohiro Kawashima), and an expanded and more diverse selection of moves. In fact, the game was so impressive that it was ported to the arcades after its initial Mega Drive release – a rare role reversal. The Streets of Rage series ended with a lacklustre third instalment that introduced several new elements, some of which were welcome (improved enemy AI) and some not so welcome (playable character Dr. Zan, an old man with a cybernetic arm and odd little jet-boots). Nevertheless, the original game fully deserves its classic status, and Streets of Rage 2, like Final Fight, is today widely regarded as one of the greatest side-scrolling beat-‘em-ups ever made. As the 1990s went on, more beat-‘em-up sequels appeared in familiar series such as Double Dragon, Golden Axe, and Splatterhouse, with some having made a clear effort to improve and expand upon the previous game or games, rather than being lazy repeats made to cash in on established success. 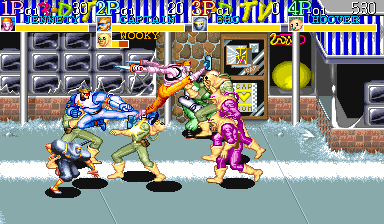 For example, Final Fight 3 added depth with the inclusion of multiple paths through the game, multiple endings, and the option for a single player to fight alongside a computer-controlled partner (new additions to the Final Fight series but not the genre as a whole); Shin Nekketsu Kōha: Kunio-tachi no Banka (The New Hot-Blooded Tough Guy: The Eulogy of Kunio and Co.), a 1994 game in the Kunio-kun series, put a heavy focus on dialogue and featured driving sections; and the developers behind horror sequel Splatterhouse 2 decided that “subtlety” was something to be mocked, and added giant, skinless, monstrous foetuses you could carve up with a chainsaw. Who says video games aren’t art? 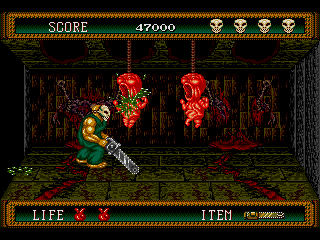 Although to be fair to the Splatterhouse franchise, the third game in the series did feature non-linear exploration and multiple endings – by this point, even a series known more for its gore-soaked visuals rather than its gameplay or anything else was making a visible effort to offer a deeper beat-‘em-up experience. A number of original beat-‘em-ups also attempted to evolve the genre, either by introducing brand-new features or refining existing ones which added something to the fundamental gameplay. For example, in 1993, Novotrade’s Cyborg Justice allowed the player to replace their character’s mechanical body parts with those from fallen enemies, a feature that Capcom expanded upon the following year in Armored Warriors. Dungeons & Dragons: Tower of Doom (1993) and sequel Dungeons & Dragons: Shadow Over Mystara (1996) were weapons-based beat-‘em-ups based on the Dungeons & Dragons licence, and both featured role-playing elements such as a selection of magical spells, unique hidden items, a deep combat system that encouraged a tactical approach, an experience-based levelling system, and the ability to sell and trade items. Although a levelling system had previously been used in beat-‘em-ups such as The King of Dragons (1991) and Knights of the Round (1992), it was Tower of Doom and Shadow Over Mystara that really embraced their role-playing origins to very impressive effect. A similar approach was taken with Treasure’s fantasy-themed Sega Saturn title Guardian Heroes (1996), which, like the two Dungeons & Dragons games, was critically acclaimed at the time and remains a highly praised beat-‘em-up. At a time when the combining of video game genres was nowhere near as commonplace and generally seamless as it is today, these three games successfully blended the frantic, fast-paced action of a beat-‘em-up with the choice and depth of an RPG, and were ideal evidence to counter the argument that the beat-‘em-up was an inherently shallow and repetitive genre. However, even though a number of side-scrolling beat-‘em-ups – both original and sequel – continued to refine and expand the genre as a whole as the 1990s continued, at the same time its popularity also began to wane due to two major factors: the surge in the popularity of the one-on-one fighting game, and the widespread onrush of 3D gaming. The former began in 1991 with the release of Capcom’s Street Fighter II, one of the most influential and important video games ever made. Street Fighter II was a revolutionary fighting game and an instant and massive success that reignited gamers’ interest in the competitive fighting genre, a genre which had been overshadowed for several years by the side-scrolling beat-‘em-up. But now, gamers once again hungered to lick the delicious, salty tears of misery from the face of a defeated real-life opponent. As had happened several years earlier in the case of highly influential beat-‘em-ups such as Double Dragon, Street Fighter II spawned a host of similar titles, and one-on-one fighting games soon offered real competition to side-scrolling beat-‘em-ups both in the arcades and on home consoles and computers. Due to gamer demand, successful fighting games like Mortal Kombat, The King of Fighters ‘94, Samurai Shodown, and Virtua Fighter generated numerous sequels, not to mention the seemingly endless versions of Street Fighter II released by Capcom throughout the early to mid-1990s. The popularity of the one-on-one fighting game at the time was enough that a number of existing beat-‘em-up franchises tried to get a taste, as seen by fighters such as the previously mentioned Final Fight Revenge, Double Dragon V: The Shadow Falls, and Golden Axe: The Duel. Nearly all such spin-off fighters ranged from average to dire, with Final Fight Revenge being a particularly glaring disappointment given that it was developed by Capcom, the same company behind the brilliance of the original Final Fight and Street Fighter II. Some games such as Tatsumi’s Big Fight and Almanic Corporation’s Mazin Saga: Mutant Fighter tried to offer the best of both worlds by including both beat-‘em-up action and one-on-one fighting, but the results never lived up to the higher-quality games of either genre, and so for the most part, the two genres remained separate. Although competitive fighting games enjoyed a relatively smooth and successful transition into three dimensions via sequels such as Street Fighter EX and original titles such as Tekken, the same couldn’t be said for beat-‘em-ups. Despite the release of 3D beat-‘em-ups such as the licensed Die Hard Arcade (1996), a game which had pretty much nothing to do with the film starring Bruce Willis’ vest and Alan Rickman; Legend (1998), a 3D PlayStation remake of a 2D 1994 SNES title; and Gekido (2000), the genre floundered in three dimensions from the very beginning, unable to adapt as well as one-on-one fighting games had, and suffering without a hit 3D title to fly the flag for it, as something like Tekken had done for its respective genre. 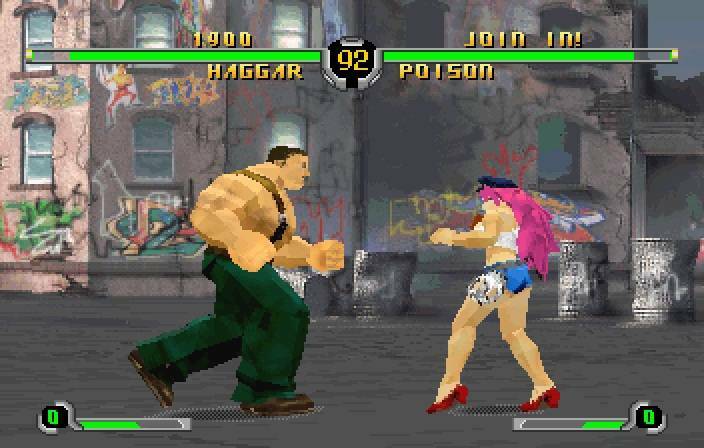 One particular beat-‘em-up regarded early on by many as having the potential to successfully redefine the genre for the 3D realm, but which ultimately failed in that goal, was Fighting Force (1997). Developed by Core Design, Fighting Force had at an early point in its development been looked at by Sega as potentially being released as Streets of Rage 4 for the Sega Saturn. This plan never materialised, however, and to this day the closest Streets of Rage 4 has come to existing was a short demo created for the Saturn’s successor, the Dreamcast. Sadly, the game never evolved beyond this demo. 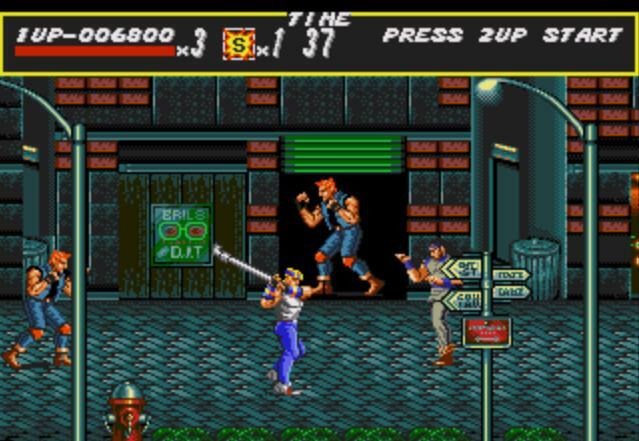 Even though Fighting Force didn’t become the latest Streets of Rage game, the influence of classic 2D side-scrolling beat-‘em-ups such as Double Dragon, Final Fight, and Streets of Rage was very much evident in its multiple playable characters, present-day urban setting, two-player cooperative play, and selection of weapons. But upon release, expectation turned to disappointment, and the game was criticised for its lacklustre graphics and sound, repetitiveness, lack of variety in the playable characters, and generally poor combat. So, apart from a few 2D gems of the mid-1990s – including Capcom’s 1994 arcade title Alien vs. Predator, among the best of the licensed beat-‘em-ups – by the turn of the millennium the beat-‘em-up genre was in bad shape, having received a three-dimensional kicking on home consoles and in arcades, the latter dying out in most places by this time. And as the majority of video games now featured 3D graphics, 2D games had become few and far between, so it wasn’t as if high-quality 2D beat-‘em-ups were still being made to counteract the general failure of 3D beat-‘em-ups. The fortunes of the beat-‘em-up genre began to improve during the sixth-generation era of video game consoles – the PlayStation 2, Xbox, GameCube, and Sega’s home console swan song, the short-lived but beloved Dreamcast – as 3D graphics and gameplay continually improved. 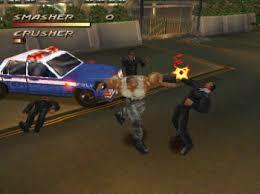 Original 3D games such as Beat Down: Fists of Vengeance and Urban Reign once again attempted to update the present-day urban beat-‘em-up but couldn’t achieve anything like the impact of those earlier, classic games, although a couple of titles that fared much better in this regard were Sega’s Yakuza, an action-RPG filled with hand-to-hand fighting on the streets of Tokyo; and Rockstar’s The Warriors, an extremely faithful adaption of the 1979 movie of the same name and a brilliant beat-‘em-up focusing on gang fighting in New York City. “CAAANN YOOOUU DIG IIIITT?” Why, yes, Cyrus. Yes, I can. 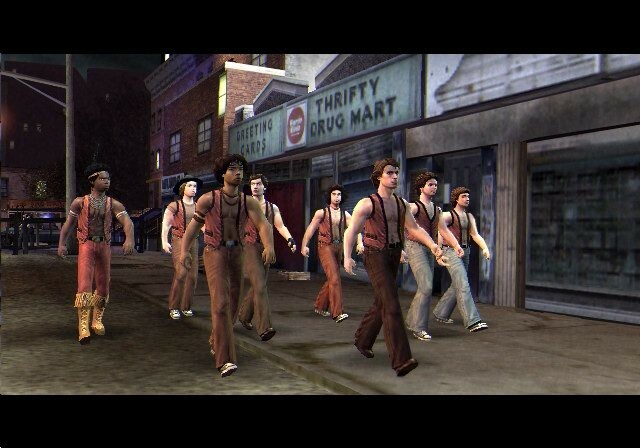 An important fact that began to become apparent during these years was that although only a few modern titles openly harkened back to games like Double Dragon and Final Fight and attempted to update that style of game for modern consoles, the actual influence of those older titles and even earlier beat-‘em-ups such as Kung-Fu Master and Renegade was much more fundamental and ubiquitous. Essentially, rather than become extinct, the side-scrolling beat-‘em-up had evolved not only into the 3D beat-‘em-up but the action-adventure / hack-and-slash game. The structure laid out by Kung-Fu Master back in 1984 – a sole player armed with multiple close-quarters combat moves battling hordes of smaller enemies and then a boss at the end of a level – had become the standard structure for hack-and-slash games. God of War, Genji: Dawn of the Samurai, Devil May Cry, Ninja Gaiden (2004), Spartan: Total Warrior, Dynasty Warriors 2 – these games and many others employed the structure of Kung-Fu Master or at least a close variation of it, although none were really considered beat-‘em-ups despite this fundamental similarity. All of the above games focused on weapons-based combat rather than empty-handed fighting, and it seems that this had become a simple but important dividing factor. Whereas in the past, “beat-‘em-up” had been a term used for both weapons-based (Golden Axe) and empty-handed (Final Fight) combat, now a clear distinction had arisen between beat-‘em-ups like God Hand and Viewtiful Joe, and hack-and-slash games, with the latter being much more prevalent than the former. The most recent console generation has continued this trend with hack-and-slash games such as Heavenly Sword, Dante’s Inferno, Afro Samurai, and Conan, but at the same time there has remained room for 3D beat-‘em-ups such as MadWorld and Watchmen: The End Is Nigh, as well as new entries in classic franchises such as neon-drenched love-letter to the 1980s Double Dragon Neon, and 2010 remake Splatterhouse. But what about where it all started? What about the 2D side-scrolling beat-‘em-up? Well, the genre has enjoyed a new lease of life over the past few years, perhaps the most influential factor in which has been the rise of digital video games, which has led to smaller-development, lower-cost games becoming a much more widespread part of the gaming landscape. This increased freedom for developers and the types of games they create means that a neglected genre like the side-scrolling beat-‘em-up is now a much more realistic, enticing, and financially viable option should a developer want to create a game within that genre. 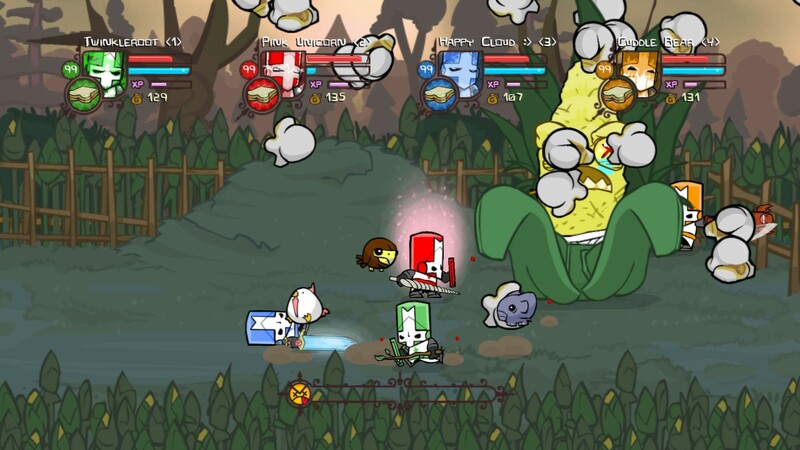 One of the best examples of the “new wave” of 2D side-scrolling beat-‘em-ups is Castle Crashers (2008) from developer The Behemoth. With four-player cooperative play, big and bold graphics brimming with personality, mini-games, a levelling system, and a massive array of weapons and playable characters, Castle Crashers is a shining example of how to update the genre for the present day without transforming it unnecessarily or sacrificing any of the things that made it great in the past, the developers listing classic beat-‘em-ups such as River City Ransom and Guardian Heroes as major influences upon the game. Castle Crashers was a critical and commercial success, and more 2D side-scrolling beat-‘em-ups followed, including Ubisoft’s Scott Pilgrim vs. The World: The Game (2010), and Klei Entertainment’s Shank (2010) and Shank 2 (2011). Just as the developers of Castle Crashers listed some classic beat-‘em-ups as major influences, so too did the developers of Shank, naming Double Dragon as their main influence. The demand for games like these clearly never really went away – gamers were simply waiting for more high-quality titles to come along. And now they have. And, like a dedicated stalker – but hopefully less bunny-boiling and stabby – the side-scrolling beat-‘em-up doesn’t look like it’s going anywhere anytime soon, as seen by the recent enhanced rerelease of the two Dungeons & Dragons titles Tower of Doom and Shadow Over Mystara, as well as upcoming original titles such as Dragon’s Crown. The recent resurgence that the genre has been enjoying, along with the high quality of many of the titles involved, has offered plenty of proof that the side-scrolling beat-‘em-up is not something that should simply be consigned to the past, but instead remains just as valid and worthwhile a video game genre as any other, with the same ability to produce excellent games as long as talented developers want to make them. With the developers of games such as Castle Crashers and Shank stating how influential the older beat-‘em-ups were to their own games, it’s clear that these beat-‘em-ups of the 1980s and 1990s have created a long-lasting legacy that goes beyond simple fond remembrance, overcomes any criticisms of the genre being a fundamentally shallow and forgettable one, and continues to have a positive effect upon new video games of the present, which is obviously a good thing. We play video games for entertainment, whether that involves navigating platforms and jumping on monsters’ heads, shooting hostile aliens in a distant galaxy, building and managing an army or a city, throwing a shiny supercar around a racetrack at 120 miles per hour, or setting out on an epic fantasy quest that ends several hundred hours later with the player finally stumbling back out into the real world, pale and squinting at the harsh sunlight over their new Brian Blessed-like beard. (Female gamers, if this final physical point happens to you, please contact your nearest hospital or circus). And here’s the thing: walking from left to right and pummelling the crap out of hordes of enemies can be argued to be a shallow experience. But if it’s done well, as so many side-scrolling beat-‘em-ups have achieved over the years, it can actually offer an immediate, dynamic, and exciting gaming experience that is hugely entertaining and a lot of fun, especially when playing alongside a friend or loved one. And again, that’s primarily why we play video games in the first place, right? To have fun? To be entertained in some way? (Hint: the answer’s “Yes”). Anyway, enough talk. I’ve got a hankering for some digital fisticuffs. As amazing a game as it is, Final Fight thankfully couldn’t have had a more inaccurate title – there’s always another city to clean up or kingdom to save, another kidnapped loved one to rescue, and another powerful criminal gang to bring down. And that’s a great thing for gamers and for video games as a whole. Alex De-Gruchy is a writer and editor of both fiction and non-fiction. 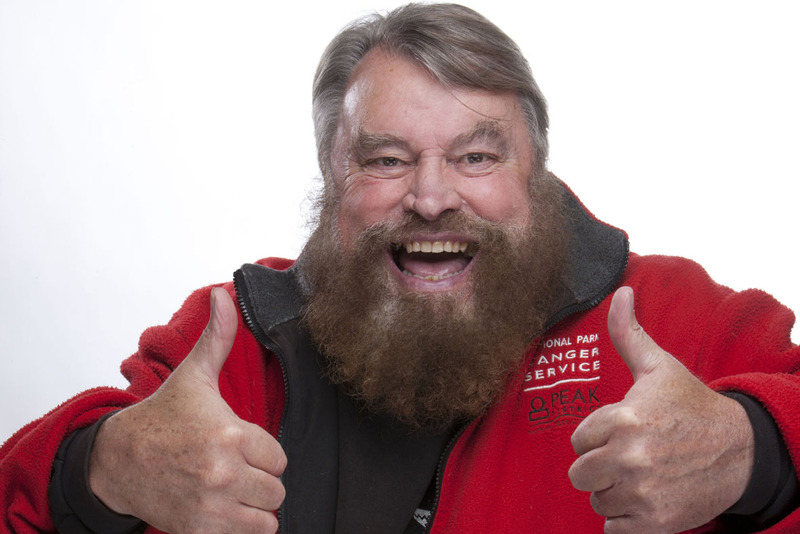 He likes whiskey and Demon’s Souls, although he finds that combining the two rarely leads to in-game success. @AlexDeGruchy on Twitter.